If there’s one weekend morning indulgence that hits all the notes, it’s monkey bread. If thereâs one weekend morning indulgence that hits all the notes, itâs monkey bread. Oh yeah, monkey bread. Havenât had this ooey-gooey treat before? Itâs traditionally made with refrigerated biscuits, butter, cinnamon and both white and brown sugar. (In other words, not the healthiest ingredient list.) Most versions are made by rolling the biscuits inÂ a cinnamon-sugar mix, tossingÂ them in a tube pan, then dousingÂ the whole thing with a mixture of melted butter and brown sugar. After you bake it, everyone pulls off the pieces and eats themselves silly.Â Iâm not going to lie, it's deliciousâand nearly impossible to stop eatingâbut thanks to all the sugar and butter, you're pretty much guaranteed to have a stomachache afterwards. The good news: We've created a healthier versionÂ of this luscious treat, so you can try monkey bread without feeling terrible. 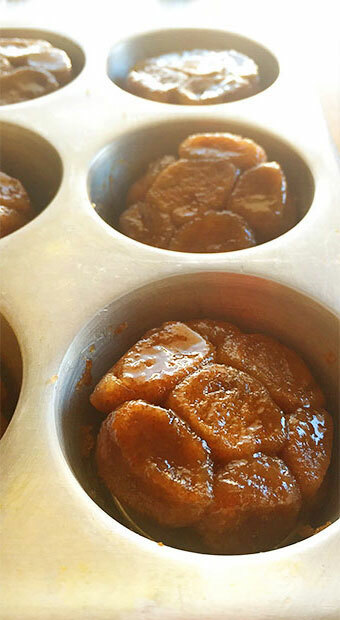 To give the traditional recipeÂ a better-for-you upgrade, we replaced the packaged biscuits with whole-wheat pizza dough, used far less sugar and butter, substituted maple syrup forÂ brown sugar, and bakedÂ it in a muffin tin to help control portions. Keep in mind, this isnât necessarilyÂ healthyâand these changes don't make Monkey Bread as good for youÂ as, say, aÂ Braised Kale Frittata. But not everything you eat has to be a kale frittata. Thereâs nothing wrong with treating yourself and your family to a sweet indulgenceÂ like this every now and then. Our recipe is simply designed to help you do it and still feel good afterwards. 1. Preheat oven to 375ÂºF. Use some of the melted butter to grease the cups of a 12-cup muffin tin. 2. In a small bowl, combine sugar, cinnamon, and salt; mix well. Turn dough out onto a lightly floured surface. Divide it into 12 even pieces. Working with 1 piece at a time, divide each piece into 5 or 6 smaller pieces. Roll them into rough balls. Roll the dough balls in the cinnamon-sugar mix and drop them into a muffin cup. Donât worry about making the dough balls the same size or arranging them neatly in the muffin cup; the more haphazard they look, the better. Repeat with remaining dough pieces. You will have cinnamon-sugar left over. 3. Whisk maple syrup into melted butter. Spoon 1 tsp. butter mixture over each muffin. Using a Â¼ tsp. measure, sprinkle remaining cinnamon-sugar mixture over muffins. 4. Bake for 9 to 12 minutes, until muffins just feel firm. Place muffin tin on a wire rack. Use a butter knife or small offset spatula to turn each muffin over. Let cool slightly, then serve warm.